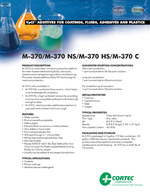 Description: M-370 is a multimetal, corrosion preventive additive for water-based metalworking fluids, lubricants, cleaners and coatings during product manufacturing. This water-based additive utilizes VCI technology for maximum protection. Package: 5 gallon (19 liter) containers, 55 gallon (208 liter) drums, liquid totes and bulk.